To All My Fellow Alethas and Friends of Alethas: GET YOUR ALETHA SWAG! For anyone that has a less than common name, you’ll understand my problems. Nobody knows how to pronounce it. Barely anyone says it right the first time. Most people don’t say it right the first ten – ten million times. You’re 9th grade math teacher calls you the wrong name for an entire school year. Even when you tell someone minutes before they announce your name (and or write it out phonetically for them)…they still say it wrong. People don’t remember your name. Spell check. Need I say more? Oh the glory of Starbucks. People ask you if you have a lisp. People ask “What kind of [insert expletive] name is that? No Characters (especially not main characters), Famous People, Products (no name tags in gas stations, no souvenirs, no cups), American Girl Dolls, or “Ladies in Songs” are named after you. You stray away from other variations with characters because they annoy you. You start collecting name tags from work, PDs or open houses because…even though it is usually handwritten (sometimes typed)…it’s your name. If there’s gossip going around, there’s no other “Aletha” to take the blame. People make one of a handful of jokes. Are you like a Greek goddess? My story is pretty wonderful (& probably my favorite), but that’s a story for another time. Thanks to the great Mimi. We now may have our time to shine. Presenting: ALETHA SHOES AND SHIRT (see Amazon link to see the name of the product). Killer Shoes! “They’re Alethas” …and not because you’re borrowing them from your sister. 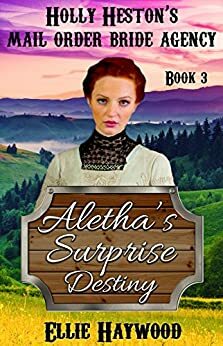 For all of you readers, READ ALL ABOUT ALETHA…the redhead mail order bride. (FOR ONLY $0.99 on Amazon Kindle) … Also, I think this will be the weirdest book I’ve ever read…because ALETHA… Does that happen to people with more common names? Is it weird to read book characters with your name? For the Aletha fans (and nonfans) in your life: Generic Name Filled T-Shirts that are perfect reminders of your greatness. Remind the world of your greatness. Excuse me while I spend all my money and time hanging out with the only other Aletha’s I’ve ever known…fictional characters and clothing. 3. A coworker almost naming their child after me (tied with the Aletha that came through the Subway drive-thru). 1. One of my best friends naming her show cow after me. That show cow being awesome. Thanks, Mimi, you made my day! Now to curl up with my new book. Download complete. Posted in A Lifetime of Stories You Wouldn't Believe, life, Things That Make Me Laugh and tagged aletha, book, merchandise, name, product, rare names, unsual names. Bookmark the permalink.